Why do we wear the black uniforms? When you visit Elements of Self Defense, you’ll notice that we wear black uniforms and you may ask “Why?” You may even just assume it has something to do with our ninja heritage, remembering the movies from the 80’s ninja boom. Thinking that the “black pajamas” image is what ninjas are supposed to wear. Allow me a moment to explain why we have chosen the black uniforms for our students. In the martial arts, the color white represents innocence or the beginning of your journey. It can also represent purity. 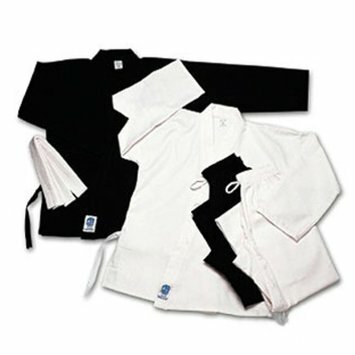 Many schools that use the white uniforms do so only with students who have yet to attain the rank of black belt. This allows them to differentiate their black belt students and remind their students that they are still beginners on the journey to martial arts excellence. To us, this seem a bit redundant when the belts tied around the students also represent their journey. The reference to purity reinforces the idea that what the student is studying is the purest form of martial arts, a gimmick that many instructors use to denounce more modern practices. They will often require that the student’s uniforms are kept in pristine, highly bleached condition – bright and flashy for appearances. In the martial arts the color black represents “the absence of fear.” The student in a black belt has attained a level of skill at which they should be confident that they can defend themselves should the need arise and therefore have no fear of violent conflict. Our black uniforms are for that very reason. From the very beginning, our students are learning skills that will assist them in violent confrontation – physical, social, or emotional. Our students are clothed in black knowing that what we teach will always have real world application – not just “in the dojo” effectiveness. When we move in the world, we move with a lack of fear. We move knowing that we have knowledge that goes beyond a kid’s hobby. Our black uniforms set us apart from the bright white masses of the average dojo. A clean white uniform shows more attention to outward appearances. A black uniform, faded with time and use, shows experience and skill. The white uniform stands out as something to be recognized for, to be set apart from the average citizen. A black uniform rarely draws attention, looking like a well worn pair of pants. This allows us to move about the world unseen – a truly ninja skill. Next Next post: Does your dojo have a curriculum?